The Anime Network confirmed on Tuesday that it will stream the Chūnibyō Demo Koi ga Shitai! 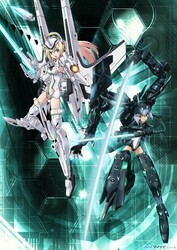 , Busou Shinki , and Hidamari Sketch x Honeycomb television anime series. The first episode of all three series will be available for free, and episodes 2-12 will be available to premium subscribers. The company did not reveal when the three series will premiere on the website. Sentai Filmworks announced this weekend that it hasacquired all three series, and the company will release these series on home video in 2013. Kyoto Animation ‘s (KyoAni’s) Chūnibyō Demo Koi ga Shitai! teen romantic comedy adapts of Torako ‘s romance comedy light novel series of the same name. Tatsuya Ishihara ( Air , Clannad ) is directing the series, and Jukki Hanada ( Rozen Maiden , Campione! ) is editing the scripts. 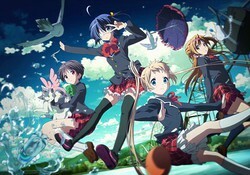 Kazumi Ikeda ( Clannad , Kanon ) is designing the characters and overseeing the animation. Yasuhito Kikuchi ( Infinite Stratos , Macross Frontier ) is directing the anime at studio 8-Bit . Takahiro Kishida ( Madoka Magica ) and Ryouma Ebata ( Blue Exorcist ) are handling character designs, and Ebata is also serving as chief animation director. 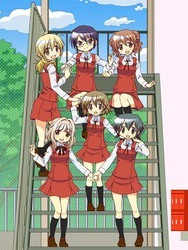 Hidamari Sketch × Honeycomb is the fourth Hidamari Sketch television series. Akiyuki Shinbo is again returning to direct the series and Yuki Yase is acting as series director. Miku Ooshima and Nahoko Hasegawa are both also returning to handle the screenplay. This entry was posted on October 3, 2012 by fyeahuta.